Tonight was to have five bands. One of the advertised bands had dropped out though but a replacement had been found - which is a shame as having five bands meant short sets. First up was Grandexit, a Swedish progressive death metal band. Due to the early start time the venue was fairly empty when they started, and since their set was only around 20-25 minutes then there wasnt much of a chance for the crowd to grow. Their set was good but really with such a short set they didnt have much chance to make a really good impression. Next up was Australian band Dawn Heist. Their sound is melodic death metal but with some electronic synth sounds added into the mic. The vocals are mainly growling but with some clean singing, and they certainly sounded good, but as with Grandexit, they only had a very short set which was disappointing. Next up was Mors Principum Est, from Finland. By now the crowd had grown considerably and the band were able to get a good response from the crowd with their Melodic death metal. Next up was Canadian band Threat Signal. They definitely took things up a level with an excellent performance that got the crowd headbanging like crazy and even managed to get a circle pit going. Fast and heavy, they were a blend of of melodic death metal and thrash metal, and I found their set to be really enjoyable. For one of the songs they got the singer from Dawn Heist to join them on stage as it was the last night of the tour. Finally came the headliners, The Agonist. Right from the start it was clear why they were the headliners as they started off as they meant to go on - at full speed and power. 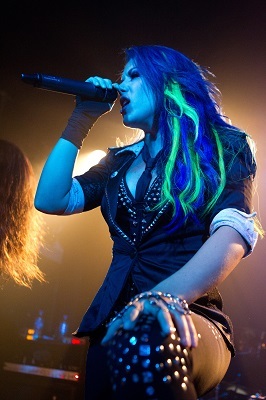 Singer Alissa White-Gluz has one hell of a voice and unleashes powerful screams and growls. Like Arch Enemy singer Angela Gossow it can be a surprise for many people at first to hear such powerful growls and screams coming from a petite female singer, but these ladies both have amazing vocals. Tonight Alissa White-Gluz is in fine form and puts in a great performance both vocally and as a front-woman. Backing her up the rest of the band also put in a top-class performance. The Agonist tonight were absolutely superb tonight. Lets hope it's not too long before they come back to the UK for more gigs. The night would have been far better though if there were only three bands on the bill as that would have let all the bands have a decent length of set as with five bands then the first three bands had sets that were far too short.